The fight for Mon Cala continues in Darth Vader #15. Yet as the battle escalates, the trustworthiness of the Jedi deteriorates. More and more hints are popping up that Master Barr may have a nasty ulterior motive for Mon Cala. The issue tackles several story points as it jumps from Vader, to Ackbar, to Tarkin. 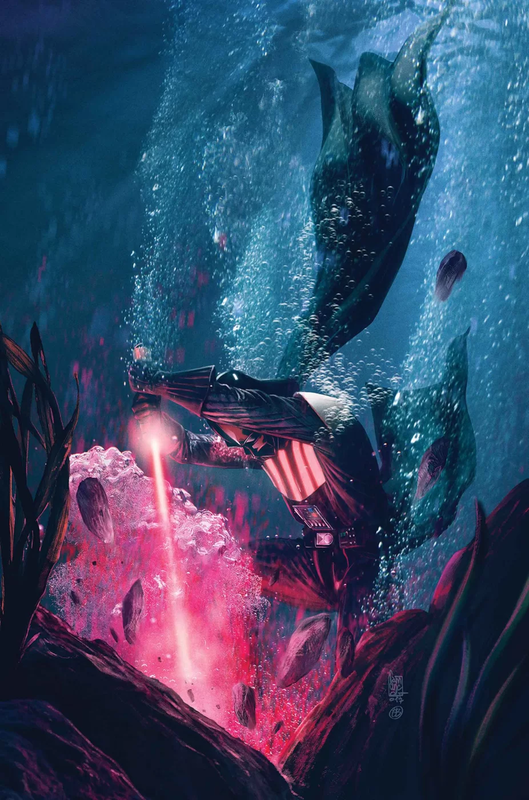 With Vader, we see him rescue himself from the depths of the ocean, subdue a giant squid monster into doing his bidding, and then tongue lashing the Inquisitors for being incompetent. With the location of the Jedi in hand, they wasted time looking for Vader rather than finishing the mission. Now it may be too late. Elsewhere, Ackbar launches an attack on the Imperials and takes out one of their skybases. He then meets up with Lee-Char, who lets slip about saving the galaxy. Ackbar questions him about whether that is his idea or the Jedi’s. It’s a hint that maybe Master Barr is using the Force to persuade Lee-Char into doing his bidding. Furthermore, there is a scene of Barr who reveals that his plan doesn’t hinge on the Mon Cala winning. This further implies his questionable agenda. It’s also disheartening to hear him say that the Mon Cala “see themselves as strong and free”, not that they actually are, or that he agrees with that. All of this looks to be the foundation for an eventual turn for this so called Jedi. The issue ends with Tarkin. His forces are not exactly winning this battle against the Mon Calamari, and they keep coming up against unexpected surprises with their technology. Right now his only ace in the hole is Vader, but Tarkin does speak of escalation. There’s an ominous panel of his Star Destroyers looming over the planet. The question is: what kind of destruction can Tarkin unleash? With good art and an interesting story, this issue does pretty good in the end. I like the intrigue Darth Vader #15 is building up. Hopefully it will pay off. I give this issue a four out of five metal bikinis.